I recently watched Fat Head which is a documentary that challenges the premise and science behind the movie Supersize Me. This film stars Tom Naughton as he takes the challenge of eating nothing but fast food for 30 days and he actually ends up losing 12 pounds. I enjoyed Super Size Me and thought it was very entertaining, but Fat Head is on a crusade to not only discredit, but make fun of Morgan Spurlock. Despite the personal attacks on Spurlock which I didn't care for, I still think this movie had some valid points and it was very enlightening. It criticizes the BMI index, the CDC, The CSPI, the food pyramid, lobbyists, and government regulation and intervention just to name a few. Tom Naughton is the director and star of this film. He is supposed to be a comedian, but he didn't come across as being very funny. 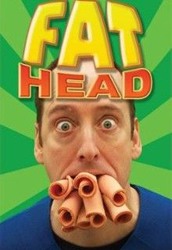 Fat Head is a very low budget production which detracts a little from it's message. I also had a problem with him only eating 100 grams of carbs per day since that is certainly not indicative of a full time fast food diet. He goes on a rant about how good animal products and saturated fats are for us and by the end of this movie I felt like he was promoting the Atkins diet. Despite the many things I didn't like about this movie, I still thought it raised some valid questions and concerns about the obesity epidemic. I also liked how it puts the responsibility for one's health on the individual as opposed to government or the fast food industry. I don't think a 30 day eating experiment involving one person qualifies as good science, but the concept is interesting. Whether you agree with this documentary or not, I think it is informative and makes some good points so I recommend it. I wonder if he has a hidden agenda, perhaps he has interests in the fast food industry. Tony, I was wondering the same thing. I thought maybe McDonalds or the Beef Council may have funded his movie, but it was such a low budget production that it didn't appear to be backed by the fast food industry. also, how do you do 3 fast food meals a day and keep carbs under 100g? no fries, bread or soda? hardly a "fast food" diet, then. That's pretty interesting. Although I'm not about to start chugging the fast food down, I do think your point about taking personal responsibility is an important one. It's up to us to decide what our own rules are.